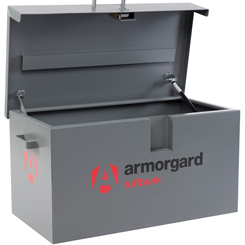 ARMORGARD have the reputation for ticking every box when it comes to providing innovative, secure storage solutions for your tools. Developed and refined over the course of the last 25 years, these unique tool storage products are regarded by UK tradesmen to be theft-proof and indestructible, whilst also allowing easy access to your tools, due to their clever, ergonomic design. All ARMORGARD products have been designed in-house and are rigorously tested to ensure that every tool storage box meets their high standards, before hitting the market. The incredibly tough range of steel plate boxes are suitable for tool storage both on site and in vehicles and have a guaranteed excellent security rating due to features including internal and external anti-jemmy systems, a fully welded continuous piano hinge and 5-lever deadlocks on each side that are operated with robust, chubb-style keys. These security features make it incredibly difficult for any would-be thief to gain access to anything contained in an ARMORGARD box, whether that is your expensive power tools or indeed any other desirables or valuables, bringing peace of mind to every user. The boxes can even be used for the safe storage of hazardous substances on site, which is an important factor in work place health and safety. Despite all the security features, the tool box is still easy to open and close once unlocked, and is highly recommended by the team at My Tool Shed. Have a question about our Armorgard range? We are happy to help. Simply click here to send us a message.